Kicking off my review with Jane Scrivner's Nourishing Cleanser - £46.00. This wonder product promises to "Melt makeup, dissolve dirt and purge pores" and right off the bat this luxurious cleansing balm did not disappoint!! Within the box you receive a 100ml tub of the cleanser, a small scooper and a fabric cleansing mitt. The method of using this product is pretty similar to most other cleansers but I love the fact that this product comes with a small scooper. Not only does it help you pick up the perfect amount of product each time, but I love how it keeps the rest of the product in the tub clean and hygienic. (Everyone knows the struggle of dipping your hands and nails in a tub over and over again!). Once I picked up the perfect amount of product, I placed this onto the surface of my skin and started rubbing this in, instantly the balm turned into an oily gel texture and my make up began to lift off my skin. Once every part of my face was covered in the balm, I placed my hand into the mitt, ran it under warm water and began to remove the product. I was so amazed by how quickly my make up was being removed with this product! As a make up remover fanatic, I've tried anything from cleansing milks, liquid make up removers, make up wipes and cream cleansers - but I have completely fallen in love with how easy this balm was to use and how quickly it got to work. I repeated these steps twice to make sure every inch of make up was removed and my skin was left so smooth and clear. With ingredients such as Jojoba, there is no surprise my skin instantly felt firmer and softer and the elements of Lavender and Sandalwood added a luxurious, spa-like scent that made the product such a joy to use. Moving onto the second skincare item; Jane Scrivner Affirmative Facial Oil - £29.00. Facial Oils are usually the part of my skincare routine that often gets left behind. Removing my make up and moisturising usually take prime position and for some reason - applying a facial oil never seemed to be a priority for me... until i discovered that facial oils didn't always have to be a mess! 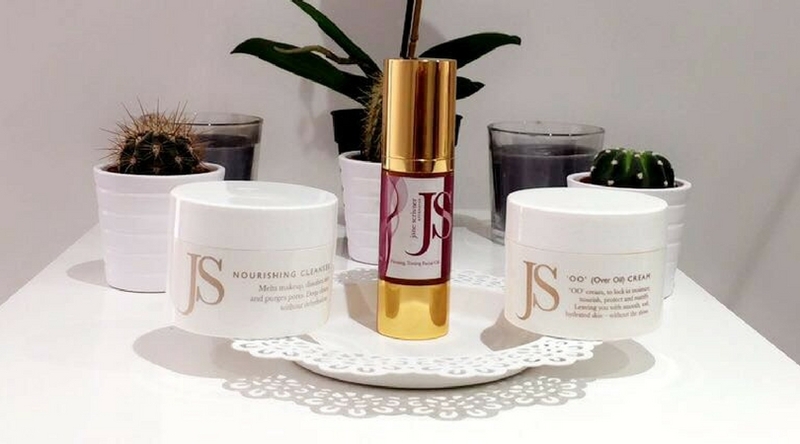 As a firming and toning facial oil, the product is said to boost collagen production and promote the growth of skin cell and after a few weeks of using this product on a daily basis, alongside the rest of the Jane Scrivner skincare line, I could see a huge difference not only in the texture of my skin but also the tone and brightness. I saw a reduction in the light bumps on my face and every morning I found my make up sat on my skin better and gave me that flawless finish I've been looking for. It is easily comparable to my Nuxe - Huile Prodigieuse Facial Oil. Like the rest of the skincare line, the toner keeps to the unique spa-like scent and the packaging meets the need of the product. With a pump mechanism that disperses the right about of product every time - there is never any wastage or over use of the oil. Working alongside the Affirmative Facial Oil, is Jane Scrivner's Over Oil Cream - £39.00This unique product is to be used after facial oils to lock in moisture, mattify and hydrate. As a brand new concept of skincare to me, I was not only intrigued by this product, I was so excited for a matiffying cream that lock in moisture without being drying. At first glance, the bright orange colour of the product, followed by the orange scent of the cream caught my eye (& my nose) and screamed "Vitamin E" which is a core ingredient of the scream. Again, the tub comes with a small product scooper which stopped me having to put my fingers into the tub and I knew the exact amount of product to use. Over all, I have been so pleasantly impressed by the whole range of skincare by Jane Scrivner that I tried out. If I was going to suggest one of the products you need in your life - it would have to be the Over Oil Cream. Not only is the concept totally unique and innovative, I love the fact the cream is specially designed to work alongside the other elements of my skincare routine and for oily skinned girls like me - the mattifying effect is a god send! Let me know what skincare picks you cannot live without!